Preheat oven to 375 degrees F. Mix brown sugar, 1/2 cup granulated sugar and margarine together until incorporated. Add oil and molasses and mix well. Taste...add more sugar if needed. Stir in egg. Sift 2 cups flour, baking powder, baking soda, salt, cinnamon, ground ginger and nutmeg together. Stir the dry ingredients in well. If very moist, add more flour, a little at the time. Roll dough into walnut size balls then roll in powdered sugar to coat. Place on an ungreased cookie sheet and bake 9 to 11 minutes until done. Immediately transfer to a cooling rack. Enjoy! 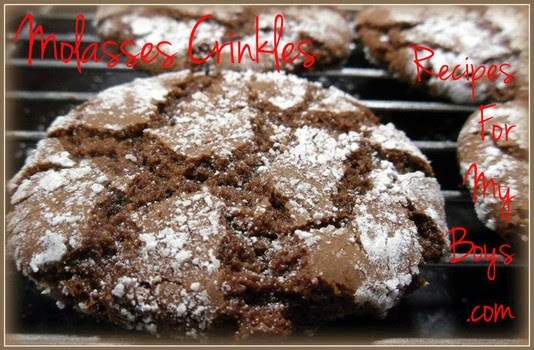 *Blackstrap molasses was used in this recipe. If using light or medium molasses, please adjust sweetness to your taste, they are sweeter than blackstrap. NOTE: For more of a gingerbread cookie, you can add another teaspoon of ground ginger, reduce the cinnamon to 1 teaspoon and add 1/2 teaspoon allspice, keeping the nutmeg.